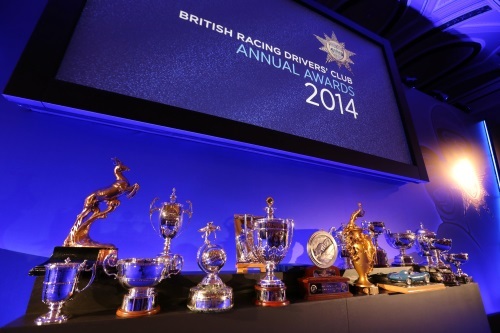 The British Racing Drivers’ Club (BRDC) celebrated motor racing achievements of 2014 in style on Monday 8 December at the star-studded BRDC Annual Awards. The ceremony, hosted by presenter Jake Humphrey, was attended by the great and good of British motor racing, including newly crowned Formula 1® World Champion Lewis Hamilton MBE, Sir Jackie Stewart OBE, Derek Warwick, Damon Hill OBE, Christian Horner OBE, Martin Brundle and Anthony Davidson. The prestigious event, staged at The Grand Connaught Rooms in Central London, was also attended by the Club’s President-in-Chief, HRH The Duke of Kent, KG, who presented four trophies at the awards luncheon. British Formula 1® World Champion Lewis Hamilton MBE was awarded not one, but two, BRDC Gold Stars, the BRDC’s premier annual award recognising the strongest performance of the year in international motor racing, with the second Gold Star awarded for winning the Formula 1® Drivers’ World Championship. The MERCEDES AMG PETRONAS driver had a fantastic season battling with his team mate, winning 11 Grands Prix from a total of 19, including his home Grand Prix at Silverstone. The World Champion was also awarded the Graham Hill Trophy for single seater racing and The Johnny Wakefield Trophy for setting the fastest lap of the season around Silverstone’s Grand Prix Circuit. Further achievements in Formula 1® were recognised with Red Bull Racing driver, Daniel Ricciardo, receiving two awards, The Bruce McLaren Trophy and the Innes Ireland Trophy, and Paddy Lowe collecting the Sir Jackie Stewart Award for an outstanding year with the MERCEDES AMG PETRONAS FORMULA ONE TEAM. A Special BRDC Gold Star award was made to Anthony Davidson for winning his first World title, the FIA World Endurance Drivers’ Championship, clinching the Championship at the penultimate race of the season in Bahrain. He and team mate Sebastien Buemi went on to take the Manufacturers’ title for Toyota at the final race of the year in Brazil. It was also a good year for British Touring Car racing with Colin Turkington receiving the Club’s highest accolade for national racing; the BRDC Silver Star. First presented in 1929. The BRDC Gold Star is the Club’s premier annual award. It recognises the strongest performance of the year by a Member in international motor sport. Points are awarded on a set formula. The BRDC Special Gold Star is awarded at the discretion of the BRDC Board for outstanding achievement in motor sport. Awarded annually, the BRDC Silver Star is the domestic equivalent of the BRDC Gold Star. THE CHRIS BRISTOW TROPHY - GEORGE RUSSELL. Special Award presented to an individual who has shown great team spirit, be it a driver, team owner, engineer or similar. Awarded to a competitor within the GP3 series who has shown potential to become a future World Champion.. Awarded to the highest-placed British driver in the FIA European Formula 3 Championship. Awarded to the highest-placed finishing British and/or Commonwealth Driver(s), in a British car, in the Le Mans 24-Hour Race. Awarded annually for the most outstanding performance by a BRDC Rising Star. Awarded to the winner of the BRDC F4 Championship.